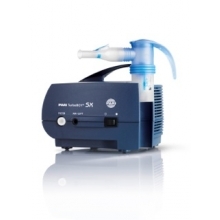 The PARI Turbo Boy SX nebuliser is mains only and is designed to treat diseases of the lungs such as Asthma, COPD, Cystic Fibrosis or Bronchitis. It is suitable for all commercially available medications. This nebuliser comes supplied with the reusable PARI LC Sprint drug chamber, mouthpiece, adult mask, tubing and AC adaptor. It gives highly effective drug delivery (less than 5 minutes for 2.5ml of salbutamol).